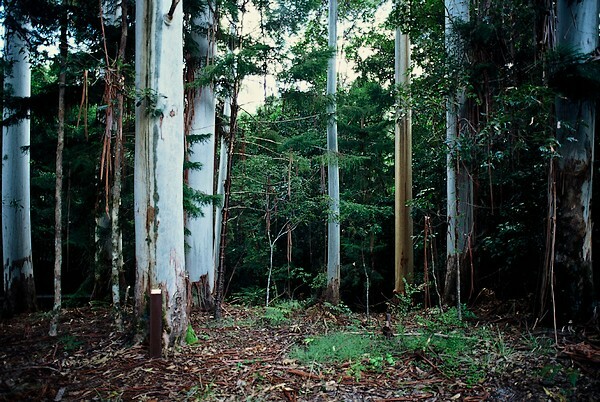 Travel with Sunrover on a fully guided adventure to the world heritage listed area of Fraser Island National Park. Sunrover small groups have been operating for over 18 years on the worlds largest sand island. 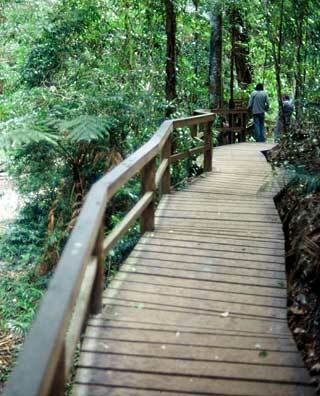 The 2 Day Adventure is one of our most popular tours for Nature lovers, walkers, hikers and travelers who want an interactive tour with wildlife and the best access to Fraser Island National Park. Staying in National Park Cabins or Rooms right on the 75 Mile Surf Beach of Fraser Island is the best way to see more. 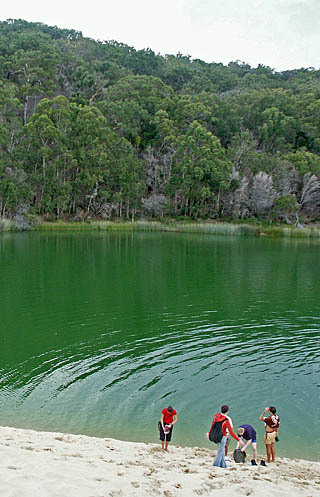 As it covers the islands greatest attractions, Lake McKenzie, Eli Creek, Central Station Rainforest, Lake Wabby and Beach shipwreck. 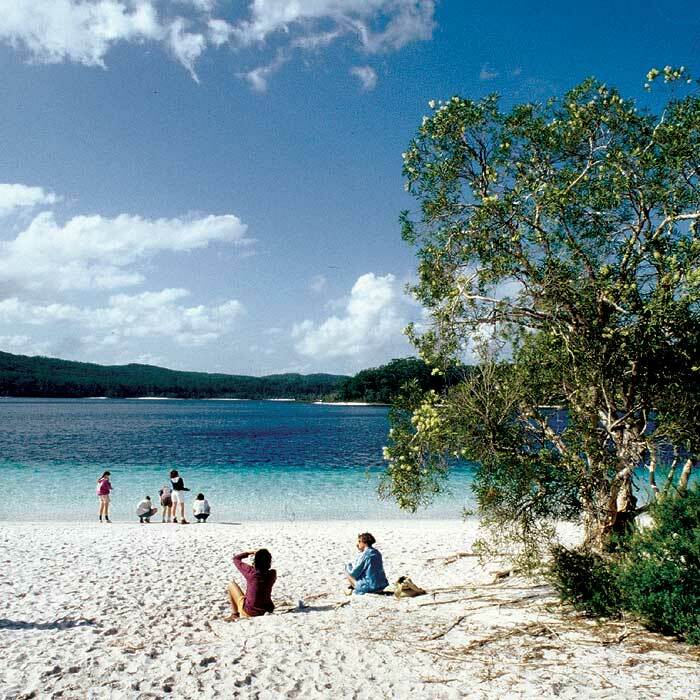 This two day tour based on Fraser Island's Eastern Surf Beach, allows for great National Park access via the beach highway, including many walks and hikes, great sunrises over the Pacific, star filled nights. Depart Brisbane, Noosa or Sunshine Coast, as we 4WD past the Glass House Mountain and Steve Irwin Way. Tides permitting we 4WD Noosa North Shore to Double Island Point and coloured sands before arriving at Rainbow Beach for an early picnic lunch. Take time to relax, visit the local beach to swim overlooking coloured sands or wander through the local shops. 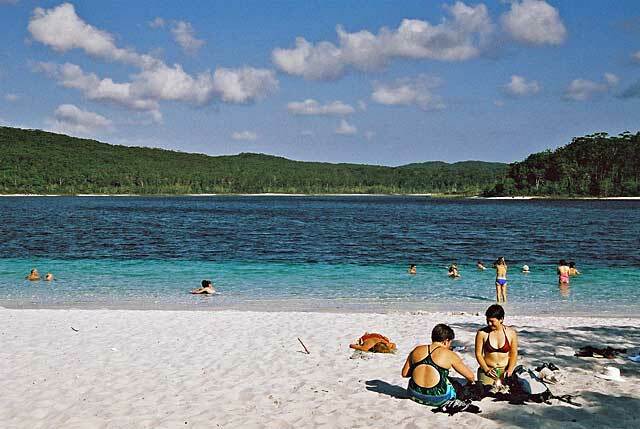 Depart for Inskip Point and Fraser Island Ferry with your local guide and driver. 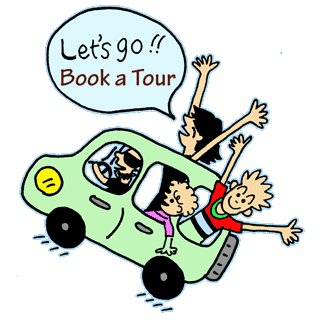 All tickets and National Park fees have been arranged prior to your arrival. As we cruise across the bay, photo Fraser Island's west coast and Hervey Bay, and keep a look out for dolphins, turtles, dugong, sharks, eagles, sea birds and fish. Arrive Fraser Island world heritage National Park. Your local guide will give information and stories both old and new as you 4WD Fraser Island's 75 mile Surf Beach with an eye out for dingoes, kangaroos and whales (in season). This journey will cover the southern tip of Fraser Island including Hook Point and cross as many as 8 Freshwater Creeks by 4WD. 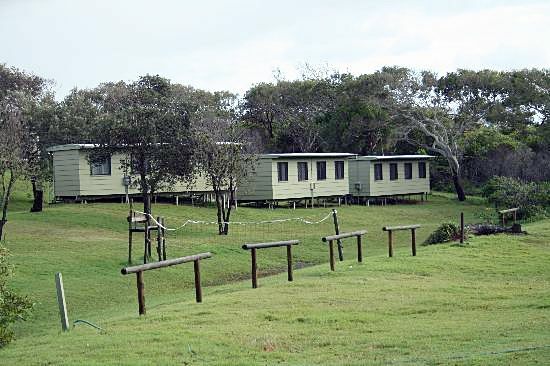 Arrive National park cabins beside the healing tea-tree waters of Govi Creek estuary - water lilies and birds. 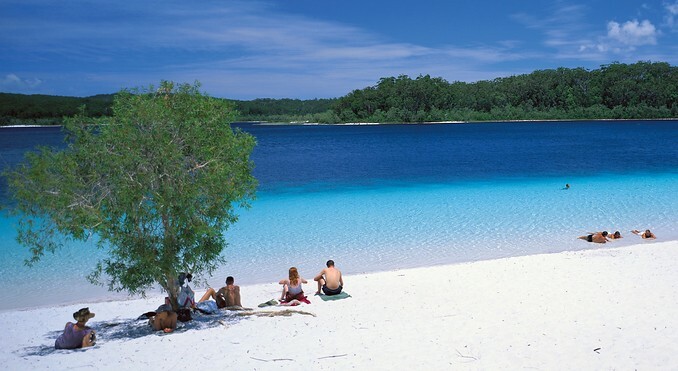 Take photos, enjoy the beach, surf, seas and sands of Fraser Island. This great afternoon on the beach highway has the bonus of a Lake Wabby Visit late in the afternoon. It's famous sand dune and Fraser Islands deepest Lake. 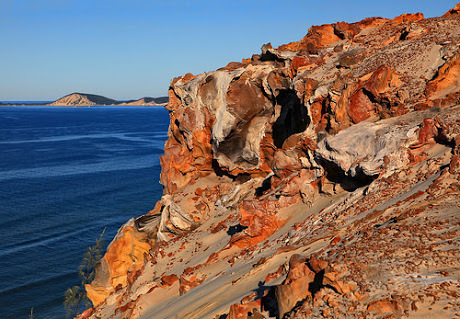 Spot turtles, swim, hike or photograph the famous sand dune. 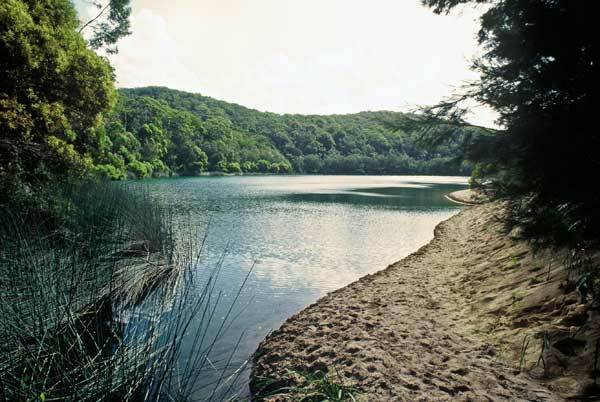 Hike return through the melaleuca and cycad forest to the surf beach and travel with your tour guide down the beach to National Park Cabin - 75 Mile Surf Beach and relax Fraser Island Style. 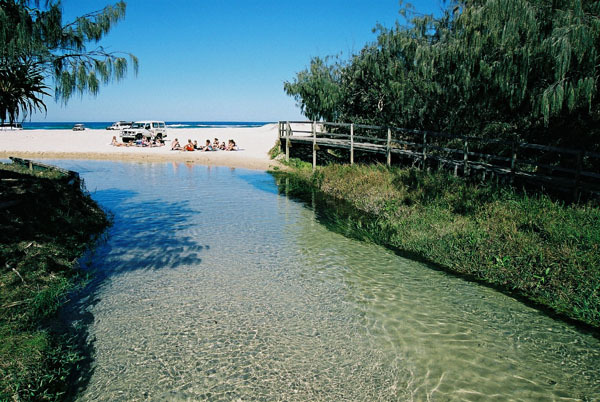 This two day tour based on Fraser Island's Eastern Surf Beach, allows for great National Park access via the beach highway, including many walks and hikes, great sunrises over the Pacific, star filled nights. The morning is yours to enjoy with early sunrise over the Ocean and surf beach of Fraser Island, or dingo search and bird watch. On return enjoy supplied breakfast. The cabins are perfect for families, groups or individuals looking for a comfortable place to stay while exploring the island. There are six cabins, each of which has a double bed and single bunk bed in one bedroom, with a double bunk bed in the other bedroom, in total sleeping up to five people. Cabins are self-contained and include a toilet and shower, as well as a small kitchenette with sink, fridge, kettle, toaster, microwave, and crockery and cutlery provided. Environmentally friendly soap, shampoo and conditioner are provided in the cabins and the amenities block. Sheets & pillowcase are provided for our accommodation guests. There are five bunkhouses with four rooms in each. Each room sleeps two people and contains one double bed or two single beds. 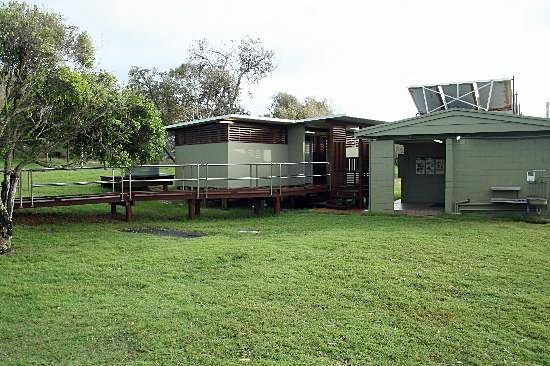 The female and male amenities blocks provide toilets and showers for campsite and bunkhouse users.